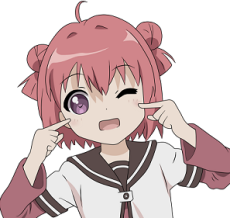 Akari is a polite red-haired girl who is supposedly the main protagonist of the series. However, due to her rather small presence and plain personality, she is often forgotten about or pushed into the background. One of her few features is hair dumplings which sometimes come off strangely. She is often thought of as having the ability to fire her hair dumplings and turn invisible whilst shouting "Akkari~n!". Kyōko and Yui are her childhood friends, while Chinatsu, Sakurako and Himawari are her classmates.